The Pilot Visto Hi-Viz Jacket is a near clone of the Pilot Direct Air jacket we reviewed in June 2014, but with one significant difference: the visibility factor. Instead of the strategically placed hi-viz insert panels used on the Direct Air, the Visto jacket is (almost) completely made up of high-visibility textile and mesh sections, while retaining the features found in the Direct Air jacket. Removable CE-approved protectors for the elbows and shoulders and an unmarked back pad, all of which can be upgraded and reinforced textile abrasion sections address the protection factor without compromising comfort. The Visto jacket also has the provision for the optional Pilot front chest protector described in the Pilot Trans-Urban jacket review. Visibility is — as could be anticipated with this design — excellent, with well-placed 3M Scotchlite reflective strips adding to low-light/night-time visibility. 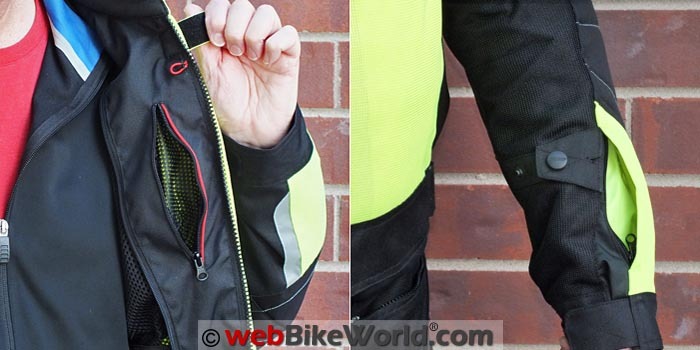 Like other Pilot jackets evaluated by webBikeWorld, the Visto Air Jacket stands out for its features, quality and value and of course, for its high-visibility presence — goal achieved. 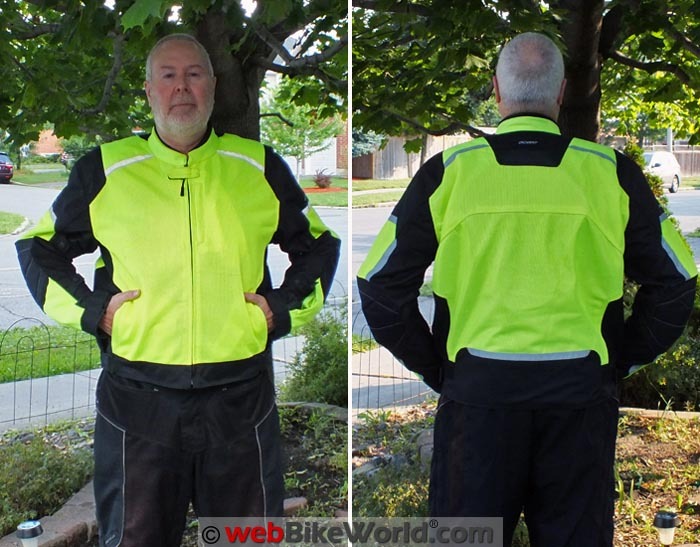 We reviewed the Pilot Trans-Urban jacket (review) in November 2013 and the Pilot Direct Air Mesh jacket (review) in June 2014 and both products scored very well overall, especially for functionality and value. Pilot gear reflects the company’s extensive involvement in motorcycling and as noted by Bill C. in the Direct Air Mesh Jacket review, the Pilot gear has “a little something extra” that adds even more to the value factor. And the Viso (view, vision, visible) Jacket, for the most part, lives up to Pilot standards. Designed in response to requests for an even more high-visibility version of the popular Direct Air Jacket, the Visto Air jacket uses the same Pilotex mesh construction as the Direct Air jacket but with a few more visibility related features. With its large predominant high-visibility sections and twice as much 3M Scotchlite reflective material on the shoulder, sleeves and back compared to the Direct Air jacket, the Visto provides maximum visibility at all times. Overall, the Visto jacket’s combination of Pilotex micro mesh and 600D overlay panels along with double- and triple-stitched seams throughout provide strength and durability all while ensuring excellent air flow (without the liner). And the liner is a zip-out waterproof polyester piece with a sealed impermeable layer on its outer side (more on this later). The protection factor is well addressed, with removable CE-approved protectors at the shoulders and elbows and a large foam back pad. An optional Pilot Core chest protector is available for installation on the provided mounting points. The Pilot “Comfort Zone” rating, based on the zip-out wind and rain liner, states that the comfort range covers from early spring to late fall (depending on where you live) over a range of 10 C to 38 C (50-100F). The low-cut collar is of soft neoprene construction for comfort (although it’s a tad big, attributable to the 2XL sizing). But, its cut and placement doesn’t rub me the wrong way. Another Pilot feature is the RedTab attachment system. While not totally unique in the market today (or did the rest follow? ), it is an innovative and useful addition in identifying, locating and using key access points such as zippers, pockets and liner tabs with a single glance. The Visto jacket uses one-way YKK zippers that are easy running and easy to use, although the generally small pocket openings (see Pockets section below) tend to make the zippers seem larger and more restrictive than they should be. A small high-visibility cross tab at the top of the main zipper acts as a guard and blends in to the overall flow of the main hi-viz panels; no spiffy Pilot logo tab here. Sleeve, cuff and side adjusters on the Visto jacket are basic but work well overall, although a couple of small changes would very much enhance their effectiveness. 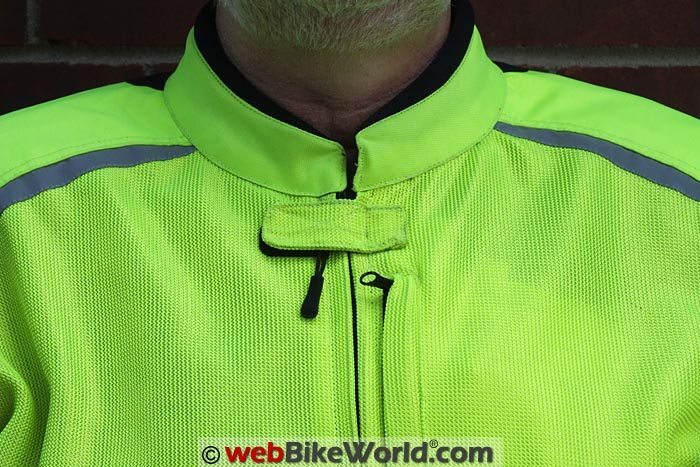 Upper and lower arm sleeve adjusters have two snap fastener positions. The basic position doesn’t result in any gathering of the material whereas the second position does, as intended and effective where a tighter fit is desired or needed. The two-position snap adjustments work, but don’t allow for fine tuning per se, whereas the two long side strap with D-ring adjusters are the ticket for customized waist adjustments. 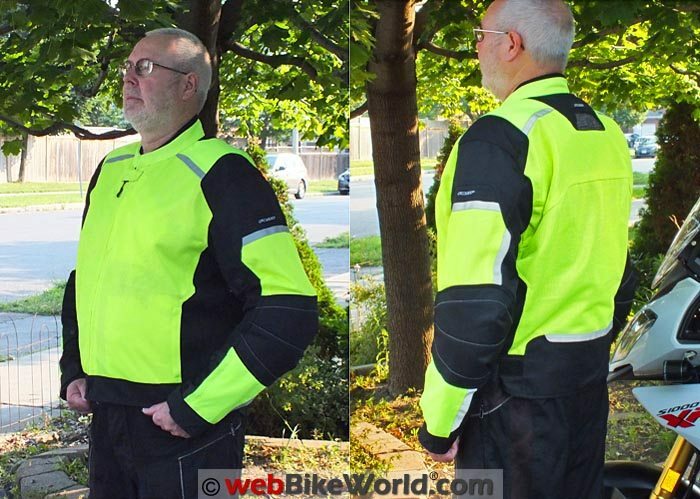 I have two other mesh jackets, both with sleeve strap adjusters and for me, this is the way to go. 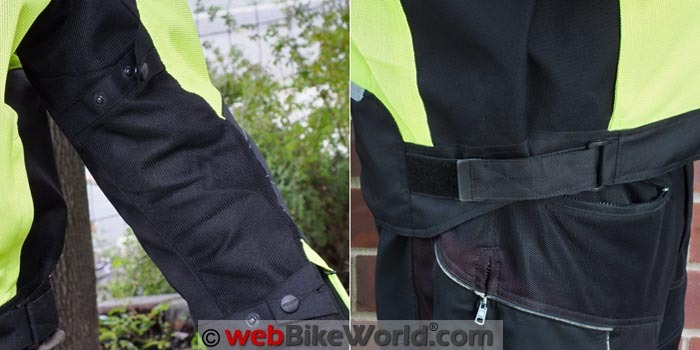 Waist cuffs are short but effective allowing for either a tight or loose fitment depending on air intake preferences and style of glove being worn. A pair of treasured and well-worn Held Air Stream (review) gloves can be used inside or outside of the sleeves. The Pilot “RedTab” system makes it easy to find and align the details. A big positive is the multitude of pockets and sleeve compartments found on the Pilot jackets, including the Visto. The Visto jacket shell has seven. One is located on the front upper left chest and one on the inside; a small waterproof pocket on the lower left sleeve; the two vertical entry hand pockets on the left and right sides and a stacked cell-phone and drop-in mesh sleeve combination on the lower left inside. The liner has a duplicate of the stacked pocket/sleeve combination on its lower left inner side; all of the pockets on both pieces can be used without much issue. Compare this to two other favoured mesh jackets that only have a total of six pockets between them. When essential personal pieces need to be carried, the storage scales definitely tip in favour of the Pilot Visto Air jacket. But while the plethora of pockets/pouches on the Visto jacket is a plus, access and use of some of them is perhaps less so. Case in point: the upper front external pocket has a 15 cm (6″) long opening, but pocket access is restricted by the large zipper, even though the pocket itself at 16.5 cm x 17.8 cm (6.5 x 7 inches) is large enough. This means that anything other than the smaller iPhone 4S needs to be slipped in and out at an angle. And did I mention the large plastic fastener stitched into the back of the upper external pocket? It is meant to serve a positive role as a key ring or something related, but it is something right off a piece of outdoor luggage — bigger than needed and it can be felt when the jacket is zipped up. In contrast, the almost 17.8 cm (7″) opening and lighter-weight zipper used on the inside upper left chest pocket allows larger devices or items to be slipped in and out far more easily. And one or both of the upper front pockets really should be waterproof as well. The front side vertical hand pockets also lose points for accessibility, due to their 15 cm (6″) openings, some of which is lost to the zipper hardware. I don’t have overly-large hands, but they still won’t fit cleanly through the openings and they just fit inside the pockets with the fingers folded. The lower left sleeve pocket has a 12.7 cm (5″) zipper, although the opening is smaller. But thankfully — as the only waterproof pocket provided — it is large enough for small high value devices like a Garmin VIRB action camera (review), keys, a small phone or a pass of some sort. And as mentioned earlier, something relevant to the fasteners, zippers and pockets is the Pilot RedTab system. Similar to other approaches seen on more and more outdoor clothing especially motorcycle related gear, the RedTab patches, piping or colourations really facilitate visual identification of key access points; simple but effective. While the inclusion of the removable liner is of benefit in extending the versatility of the Pilot Visto jacket, it is at the same time the weakest feature of the jacket. The liner is not cut for wear as a separate garment but is strictly a zip-in, with four snap tabs further serving to reduce its movement when the jacket is put on or off. The downside becomes apparent in wearing the liner, even in cooler temperatures. The material is listed as polyester, but not specifically mentioned is the rubber or rubber-like sealed-seam coating on the inside. As such, the liner most assuredly provides good protection from the wet stuff (and some insulating properties) but this same non-breathing seal prevents air circulation and moisture-wicking away from the upper torso area. 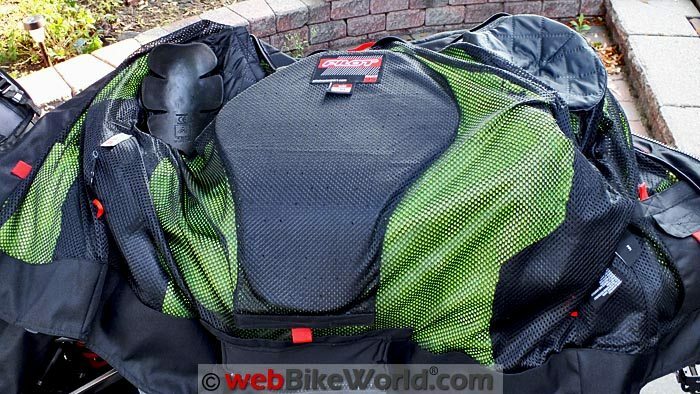 Given the multitude of excellent and even outstanding textile-based breathable waterproof liner solutions on the market, some used constantly with the other two mesh jackets and other riding gear would be welcome additions to the Pilot Visto Air (although this might raise the price). Removable CE-approved protectors are used at the shoulder and elbow, with an unmarked foam back plate installed in the back pad housing. All of the protectors on the Pilot Visto jacket are upgradeable to Pilot Core components or similarly-sized products from other manufacturers. A chest protector is also available as an option, with the required mounting pieces already in place on the Visto jacket. Available in Full, Half or Micro sizes and shapes, the piece fits across the front inside of the jacket, attached to a large section of hook-and-loop on the right placket and secured on the left side to a small RedTab loop located on the upper left placket. The jacket can be opened and removed even with the protector installed. The issue of sizing with Pilot jackets has been identified and subsequently discussed in the previous Pilot product postings, so time to add my two cents worth. I am, dimensionally, very close to an XL size, based on the accepted industry standards, although like other motorcyclists who have used products from virtually every brand on the market, fitment versus size requirements can still be “dynamic”, even within a product range. As such, given what is typically known as the “fudge factor” and so that some wiggle room inside the garment is provided (for layering and physical flexibility) I had the Editor order up all three pieces in 2XL sizing. Results? Well, the Visto jacket with the liner is just about bang on, with about a half-size of the desired wiggle room and lots of length in the sleeve, a requirement with me. Here is the Pilot jacket size chart on their website. Pilot says “…we’ve made every effort to have our sizing reflect that which our customers are most familiar with. So if you’d wear a casual jacket in a size large, odds are good you’ll wear a size large with us as well. Removing the liner for usual warm (hot) weather use frees up a bit more space, but with a significant positive increase in air flow. A Visto jacket in size XL would have likely been a snugger fit with more shape, but also with less room inside and in all likelihood, some diminishment in air flow. And it is probable that the sleeves (might) have been a bit short, although many manufacturers don’t vary arm lengths too much between XL and 2XL. With the supplied liner removed and a somewhat larger and heavier but ventilating liner used for the cooler days, the Visto Air Jacket fits just right. Although to me — being used to a long or three-quarter style jacket — it seems a bit short. The included back pad and shoulder and elbow protectors. There is no arguing that the Pilot Visto Jacket provides excellent visibility, day or night. Between the high-visibility body panels and sleeve inserts, along with well-placed 3M Scotchlite strip inserts, the Visto jacket is a very visible step-up from the Direct Air and similar jackets on the market. It doesn’t have quite the same “in your face” impact that my daily use BMW Boulder 2 Neon Jacket (review) provides, but the Visto is close; never a bad thing from my perspective. And of course we can’t forget ventilation; this is a mesh jacket, designed to move lots of air around the wearer. With the liner removed, air flow is very good as expected given its mesh construct and the extra space between jacket and body. I did tighten the adjusters on the sleeves as a test, but they ended up being overly snug, diminishing overall air flow. Between the weight of the material used and the jacket’s overall very good air flow, even with the extra material in the body and with the sleeves loosened off, there wasn’t any buffeting of the material on un-faired or partially faired motorcycles. Just don’t forget dehydration and hydration management issues that can be so prevalent, especially when mesh gear is worn for long periods of time. The Pilot Visto Air Jacket is a very good outer garment and at $165.00 USD represents great value, even with the somewhat questionable liner. The liner is something that can be swapped out by the owner, but will hopefully be addressed by Pilot. In retrospect, having both an XL and 2XL Visto jacket would have been the ideal for this review for comparison purposes, but I don’t regret going the 2XL route, because “you can’t use what you don’t have…”. And it seems the jury could be hung on the size issue, depending on which industry chart is used. But, Pilot offers one free exchange if needed and a return mailing label is even provided in the box! The Pilot Visto jacket can also be matched with the Pilot Omni Air Over Pants (review) for a nice summer outfit at reasonable cost. List Price (2015): $165.00 Available Here! From “T.M.” (August 2015): “After reading your review of the Pilot Direct Air Jacket I hustled over to Pilot’s website to check out their products. After looking around I decided to order the Visto Air as I want to be as visible as possible. Also it matches both of my HiVis helmets. I called Pilot for sizing advice, my XL fits perfectly and is comfortable in 90 degree weather. 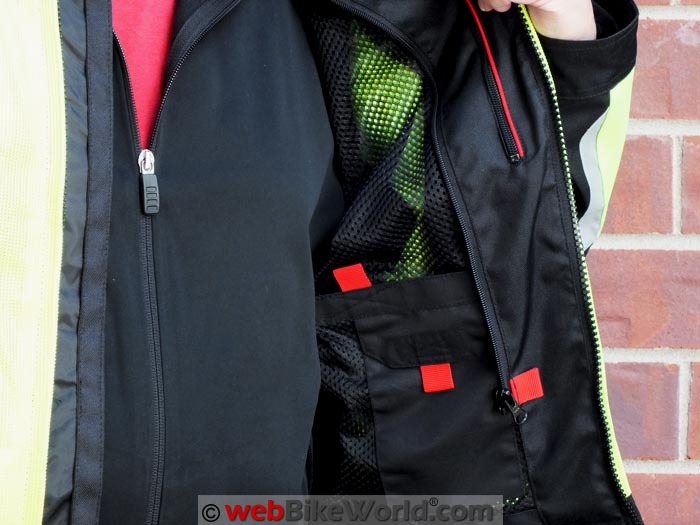 Love the jacket and thank you webBikeWorld for the Pilot reviews as I never would have found the company without them.